Bonang is the CEO of Business Leadership SA and until June 2017 the Vice President Upstream & Chairman of Shell Downstream SA, Shell SA Holdings; Shell SA Refinery and South African Petroleum Refinery. Prior to that he spent 6 years as CEO of Drake & Scull FM SA. 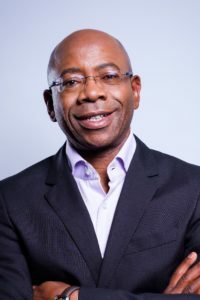 He also held two CEO positions at Sanlam: Corporate Marketing and Shared Services & Associated Companies and alternate director of Sanlam Limited main board; chairman of the board of TASC; a director of Innofin; Gensec Property Services and Fundamo. He was Executive Vice President at SAA until Aug 2001 and before that MD of OTIS (Pty) Ltd.
Bonang acquired Business and Management experience by spending more than ten years in the pharmaceutical industry progressing through various positions, including product management and new business development management – culminating in being appointed Export Manager at Logos Pharmaceuticals and Head: Public Affairs and Communications at Sandoz Products (Pty) Ltd. He has facilitated numerous strategic planning workshops for corporates, shared a stage with international speakers and authors such as Dr. Stephen Covey, delivered numerous papers at fora around the world and been a guest on numerous International TV, radio and magazine programmes. He regularly runs Life-Skills and Motivational Seminars for students and has been awarded Honorary Membership of Technikon Northwest Alumni Association. His awards include ‘first RSA Nation Building Champion’, ‘Titans – Building the Nation ” CEO Magazine Awards, Honorary Professorship in Marketing Management by the University of Pretoria, where he serves on their Advisory Council, IPM CEO of the Year, South African Facilities Management Association ‘Personality of the year and President’s Award, Top 300 Companies Award, Most Transformed Supplier – Standard Bank, Black Management Forum’s Manager of the year and Presidential Award for his “Servanthood in South African Industry & the Economic Empowerment of Previously Disadvantaged Individuals”.